One of the constant themes throughout scripture is God’s protection of the helpless and hopeless. This is why it’s so important for followers of Jesus to live out an expression of justice by caring for orphans. It’s one of the clearest ways of demonstrating the heart of God and the gospel to the watching world. In a span of just 48 hours, I had been overjoyed to become the father of a beautiful baby girl, and then driven to anguish to realize how sick she really was—six months old and only seven pounds. Exhausted and overwhelmed from knowing my daughter may not make it through the night, I began thinking about how I could get out of this mess. I started thinking of all kinds of “outs” in my mind, like how much of an inconvenience the whole ordeal had been for us already and how improper it was to be given such a sick child. Kari sensed my anxiety and encouraged me call the one person who always seemed to have the right answers—my dad. Hearing his voice was always so calming and his words filled with wisdom. It was the middle of the night back home, but I needed his encouragement, and I’m still so grateful he woke up to answer the call. Did my dad just tell me to Man Up? I asked myself. Where’s my validation? Doesn’t he understand how much I’’m going through? He must have known what I was thinking because he repeated himself to make sure I knew I heard him correctly. The ideal social justice from a Christian perspective is not to build more orphanages, but to help prevent orphans by helping them stay with or be reunited with their birth parents and families. If that’s not possible, the next best solution is to find a new family for them through adoption. Whichever path is taken, God’s solution for the orphan crisis is still family. 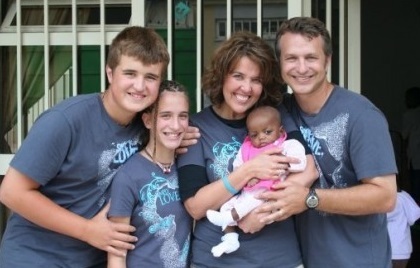 For Christ-followers, orphan care and adoption is a privilege. It’s the perfect reflection of our Father in heaven who, through the blood of His Son, adopted us as His own sons and daughters. Regrettably, there are over 175 million orphans worldwide who are still dreaming of becoming a son or a daughter in a healthy, loving family. That’s over half the population of the United States. I’m so thankful for my dad speaking truth to me. I was afraid, but with prayer and his encouraging words, I was pumped to go fight for my daughter’s life. Zoie is now a healthy, beautiful eight-year-old girl that I could never imagine life without. Since that time, I’ve learned a lot about what it means to be a father to the fatherless. I have made sure to never give her reason to question my commitment for her and she knows she is my daughter, grafted into our family with love. It wasn’t convenient for Christ to walk on this earth for 33 years and be the ultimate sacrifice for our sins. But this never stopped Him from living His life “Out Loud” for us. Because of that, we have the ability to see His love for us and never have a reason to question it. He died on a cross—the most humiliating and shameful death imaginable—so that we may have everlasting life. I’m embarrassed to think how a few tense moments made me want to throw in the towel. Thankfully, Jesus saw past the inconvenience, excruciating pain, and the hardness of our hearts. He followed through on His purpose because He knew we were orphans in need of an Abba Father. There are 28,000 orphans in Texas who need a family to live “Out Loud” as Christ did. The biblical mandate to care for these kids has been addressed directly to Christians, not the government. I believe this is because Christ followers are uniquely equipped to love and care for orphans based on our adoption into the family of God through salvation. Certainly, government can and does offer tangible orphan care services. However, Christ followers are the ones even the government calls on to spearhead this movement because it’s personal for us. We do it not out of guilt but because we’ve personally experienced spiritual adoption, and we want to share the greatest story of salvation with others who are fatherless. Over the next three Sundays, you will have the opportunity to learn more about Fellowship of the Parks’ Orphan Care Initiative during the 9:30am service, and join the team. Join us for coffee and donuts and find out all the ways you can make a difference in the life of a child here and around the world, living James 1:27 Out Loud. We want to challenge you to join the orphan care team–to love and serve big! The best is yet to come! Roger & Kari, I’m grateful for your challenge to us as Christ followers to Man Up and defend those that need it the most. I cannot wait to see the impact our orphan care ministry is going to have. Pastor Chuck thankful for you & the entire FOTP church staff & family for fearlessly living Out Loud to defend the fatherless! It’s an honor to be surrounded by world changers ! Praying this movement is contagious! We are all called to Simply Love.